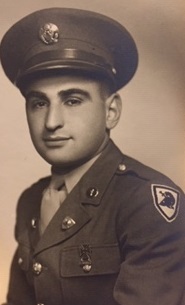 Obituary for Lazarus Goshkarian | Seamon-Wilsey Funeral Home, Inc.
Lazarus Goshkarian, 94, of Rte. 32 died Friday, November 30, 2018 at his residence. Born June 7, 1924 in Manhattan he was the son of the late Joseph and Rose Goshkarian. A Veteran of the Army/Air Corp he served honorably during World War II. For over 25 years he was employed by the Town of Hempstead Police Department. A Saugerties area resident since 1994 he previously resided in Wantagh, Long Island. Great Nephews: Joseph R. (Heather) Mayone, Michael D. Mayone, Great Niece Danielle N. Mayone and her fiancé, Chris Alberts and Great Great Nephew, Lincoln Joseph Mayone. He was predeceased by other family members including, Arson and Florence Asterian, Sue A. Damis, Helen and Michael Mayone, Joseph and Lucy Damis and Michael F. Mayone. His Funeral Service will be held privately, with interment with military honors in St. Mary’s Cemetery in the Damis Family Plot. Arrangements are under the direction of the Seamon-Wilsey Funeral Home, Inc. Cor. Of John & Lafayette Sts., Saugerties. Family suggests donations in his memory be made to the Altzheimer’s Association. Expressions of condolence may be shared with the family on Larry’s Tribute Wall @SeamonWilseyFuneralHome.